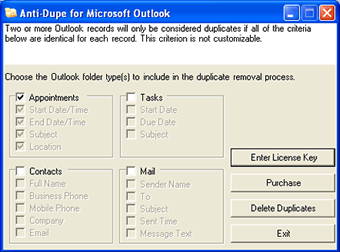 Anti-Dupe for Microsoft Outlook is an add-in utility that allows you to delete duplicates in Microsoft Outlook. Anti-Dupe for Microsoft Outlook’s easy interface lets you quickly and easily delete duplicates in your Microsoft Outlook Email, Contacts, Calendar and Tasks folders based on criterion specified by Anti-Dupe for Microsoft Outlook. Although the criterion that Anti-Dupe for Outlook uses to find duplicate records in Outlook folders is not customizable, you can specify in which Outlook folders and sub-folders that Anti-Dupe for Outlook will scan and delete duplicate records.